This hotel is in such a great location with great views of the amazing Colosseum. The staff on the front desk were extremely helpful. The young lady (sorry didn't get her name) pointed out all the highlights of Rome and how to get there even made a phone calls to check on availability. The room with a view was excellent. The restaurant is ok but it needs a bar for socialising as the roof top is only opened in warmer weather. Recommend highly and we will be back. Stayed here for our short little stop in Rome, excellent location just a two minute walk from the colosseum. The Staff were really friendly and welcoming, rooms are comfortable and relaxing. Just what you need really ... try this place out if your looking for something good in Rome.. Fantastic location. Steps away from yummy food, historical monuments, room is comfortable,clean and spacious. Reception staff is very friendly and helpful. 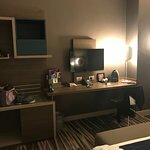 I would definitely stay here again and would recommend for people travelling with kids as it's close to food,and sightseeing, they wont have to walk far. The break was lovely and hotel was clean and staff pleasant. Breakfast was a decent continental selection but room service did not provide a great choice. We did the tourist restaurants on a few evenings but then we braved the more secluded off the beaten track places and food was much better and cheaper. You need comfy shoes as I donâ€™t think I have walked so much but it was worth it for the sights. I want to go back as there was so much we didnâ€™t see. The only downside was the pool in the hotel shuts for winter but there were a few gorgeous days when I could happily have cooled down in there. Highly recommend visiting but donâ€™t just stick to obvious places, walk down a few side streets and I guarantee you will find some amazing restaurants.